Young fan: Pope Francis touches the head of a child as he addresses pilgrims in St Peter’s Square at the Vatican on October 26. He addressed an estimated 100,000 people taking part in a Year of Faith celebration of family life. POPE Francis’ kindness to a little boy who joined him on stage during a recent address to families “should not be a surprise”, Bris-bane youth worker Jess Woodward said. 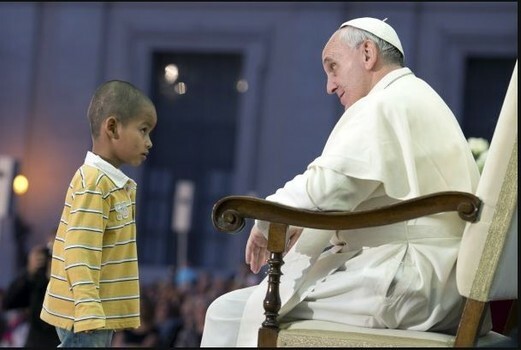 Pictures and memes of a little boy who sat on the papal chair have circulated on the Internet. Ms Woodward said she had seen a meme with a picture of the little boy in the papal chair, accompanied with the text, “Move your feet, lose your seat”. “I just laughed,” she said. Posting the story on Facebook, Ms Woodward mentioned in her status that, inspired by the Pope, she would call her first child Francis or Frances. Ms Woodward said the Holy Father’s leadership was something that secular media found “surprising”. “Secular media is used to seeing someone in a position of power as distancing themselves from the people, but that’s not what they see from Pope Francis,” she said.